Mobile Business Intelligence (“BI”) applications offer compelling ways for enterprises to share information with employees, customers, and partners wherever they need it. Due to the nature of mobile devices, these applications (“apps”) present new security challenges that must be addressed by both the BI platform and the security capabilities of mobile devices. Data access, data transmission, and data storage must all be considered when deploying a complete and secure solution. 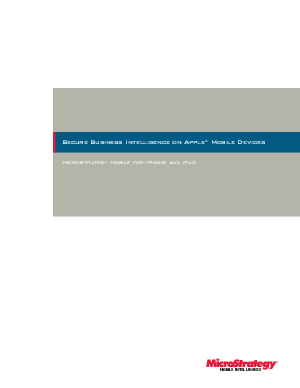 This paper will discuss the security capabilities of MicroStrategy Mobile on Apple’s mobile devices.